The 3rd generation Ford Galaxie (1965-1968) was a behemoth of a full-sized automobile, and the sedan version crushes the scales at something like 3800 lbs dry...which isn't much more than the typical BMW 3-series these days, but back in the 1960s it was massive. Not so huge that it would require a heavy duty turbocharged diesel engine up front...but...that is exactly what happened with this next combination of heavy fuel and patina. 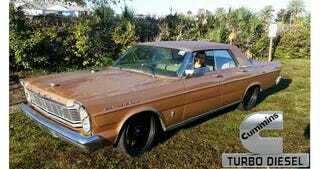 Find this 1965 Ford Galaxie Turbo Diesel Cummins 12V offered for an undisclosed price (or trade) here on craigslist located in Atlanta, GA. Tip from Andy L.
Under the hood is a Cummins 6BT 5.9 liter inline six, commonly known as the "12-Valve." The 6BT was first designed for use in agricultural machinery, but was adapted for street vehicles — mostly light/medium duty and some heavy duty trucks/buses. The turbocharged and intercooled engine pushes out 500 horsepower and 800 ft-lbs of torque according to the seller, but it weighs 1100 lbs dry and will bring your classic Galaxie to modern 5-series curb weight range. It looks like an outside-the-bun thinker from the deep south had an affinity for oily fuel and big, old sedans. A shotgun wedding ensued between the Cummins and the Fords and this is the offspring: A Diesel powered 65 Galaxie Sedan. Under the patina'd hood with an exhaust stack peeking through it is 500 Horsepower and 800 Lb/ft of torque. After taking this car for a spin, and you start using your words again, I would guess you would describe it as a frightening experience unlike any other you'd had before. Admit it. You are really curious about how it would feel to drive this thing. The seller is touts the car's dependability and fuel mileage (because this is the real reason you buy a 1966 Galaxie that can roll coal) and included in the sale is a stack of red solo cups in the trunk. Power from the engine goes to a "built" automatic transmission (hopefully this came with the Cummins 12V because the original Galaxie transmission would soon sound like a music box in a blender) and eventually to a Dana 60 solid rear axle from some other HD vehicle. A serious amount of money and time has been put into setting up this monster...but...what will a 3rd party be willing to shell out for it? Originally published as 10k: Out Of This World: 1965 Ford Galaxie Turbo Di... on Daily Turismo.